There are some who say that arcades are dead in America. But while some did die out, others evolved. 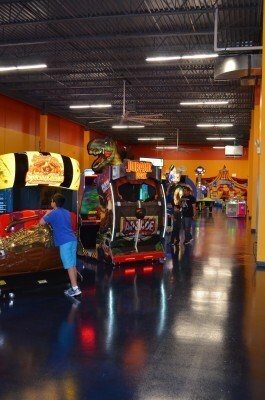 It’s true that arcades are no longer a common place for young up-and-coming gamers to hang out and hone their skills, but they live on as party venues and places where parents and kids can both have a good time. 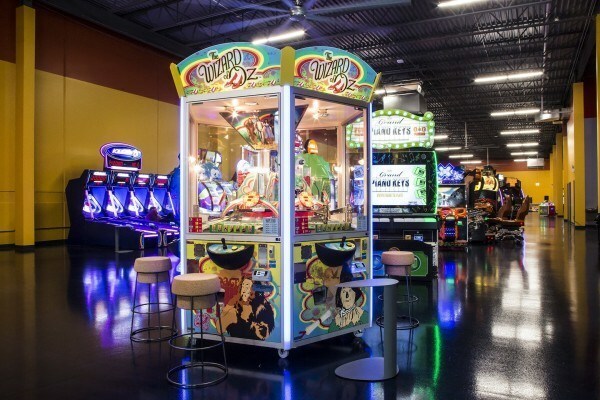 With this switch to arcades becoming event spaces, fewer and fewer of them are being seen as standalone facilities out in the wild. Here in Chicago, we happen to have two excellent arcades at or near downtown, along with a number of “barcades” north of downtown. Up until recently, however, the south side lacked anything of the sort. The good news is that there is now a family-oriented arcade in the southern part of the city called Razzmatazz. That VideoGame Blog was invited to take part in the new space’s grand opening, and Andrew and I were happy to attend. Our reaction at the end, though, was mixed. Right now Razzmatazz is mostly meant for children, but there are plans to add a bar and restaurant to entice adults as well. This makes sense, as there is a lot of open space in the very large room holding all of the games. For now, an area near the entrance has tables set up for serving food, primarily at birthday parties and the like. In the back, there are a number of large inflatables (think bouncy castles) for younger kids. Everything else is games, though. 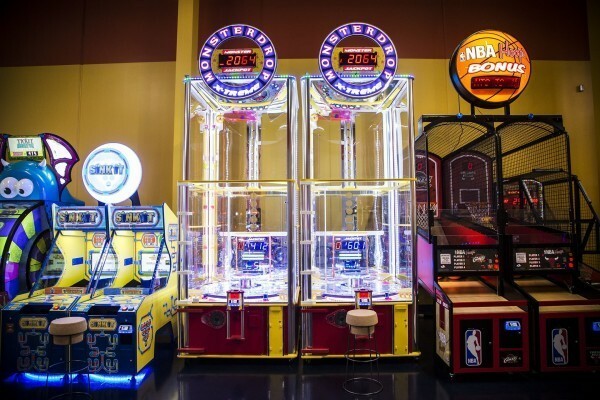 Like most arcades, they have both ticket-earning games and more traditional arcade games. There were a few in particular that we found interesting. On the ticket side, they had one type of game I’ve never seen at an arcade: a laser maze. The laser maze is a chamber full of smoke with green laser pointers, basically, pointing in every direction. Your goal is to get to a button on the other side of the chamber, crossing as few lasers as possible. It’s very much a secret agent experience, and it’s definitely not easy. (Andrew: it was hilarious watching Jake falter his way through the maze, and I certainly didn’t fare much better) Nearby is something else I’ve never seen before: a mini bowling alley. It’s exactly what you’d think: it has everything you’d find in a bowling alley, but on a smaller scale. It was slightly disappointing, since the press material just said that there was a “bowling alley,” but it still deserves credit for being a cool thing to have at an arcade. Notably, one of the cool things about this place was that none of the games dispense physical paper tickets, but instead everything is recorded digitally on a reloadable card that you keep with you. The cards keep track of both how much money you have left, as well as how many tickets you’ve accrued. Other ticketed games included your standard skee-ball, spin wheels, and basketball hoops, but more novel stands were present as well, including a beer pong-esque game called Sink It and a roulette-like game with large balls that fall from the top. There were some very good non-ticket games as well, though only a handful. It’s largely what you would expect, but it’s a great selection given the size. 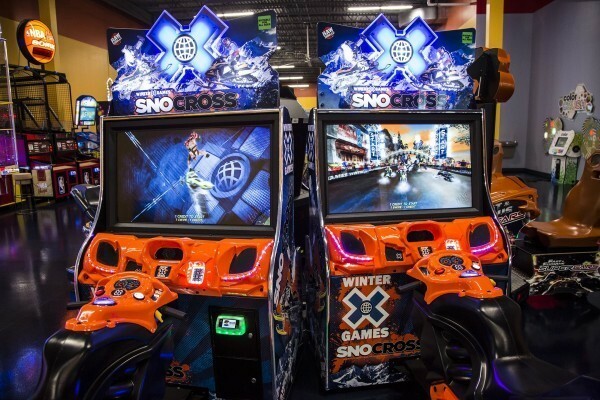 Standouts include the now ubiquitous Transformers Human Alliance (a two player light gun game), Winter X Games Snocross (a snowmobile racing game), and Typhoon (a motion simulator ride). 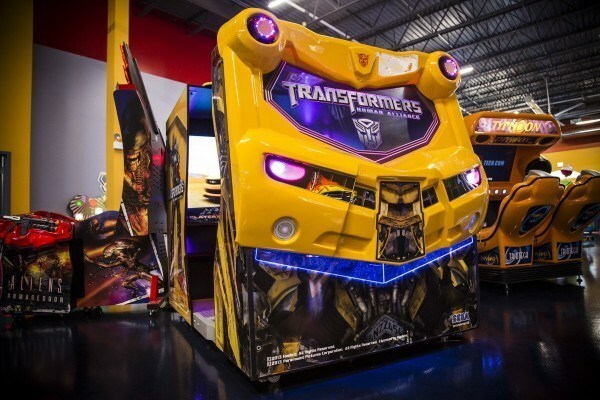 Unfortunately, while they have two cabinets for each of the racing games, they aren’t hooked up for multiplayer races. This isn’t the only issue that the new arcade seemed to have, though. They had plenty of open space in the Razzmatazz area, for example, but seemed unsure about the idea of adding more games. In our interview, Widell stated that they would be adding and rotating games as time went on, but there seemed to be a lot of unutilized space that could fit more games. Hopefully they can figure out how to maximize the area in their building and pack as much fun as possible in there. The ticket redemption process was also decidedly less than ideal. Granted it was the first day, but the redemption lines were extremely long and disorganized. While it was irritating to sit there waiting, it’s something that will almost certainly be fixed in the near future. In addition to the long lines, they also didn’t have any system to combine tickets on multiple cards. There are ticket-counting machines, but at the time we were unable to redeem two ticket receipts together. So, for example, if you are playing games alongside your child, and have enough tickets combined to get that awesome Skylanders figure you(r child) is eyeing, you still wouldn’t be able to get it since the points are separated on distinct cards. That part at least will be fixed as soon as they have everything set up, which may already be taken care of. The biggest delay in the redemption process came from a single game. The Wizard of Oz-themed medal pusher game near the entrance doesn’t dispense e-tickets (and kudos to Razzmatazz for not using paper tickets, by the way.) Instead, it dispenses small plastic tokens and cards that can be redeemed for tickets. Though there are machines available to count the tokens, Razzmatazz had employees count them manually. It’s easy for someone to come up with a big cup full of tokens and cards, slowing down the process. Razzmatazz is clearly going through some growing pains, but even though it isn’t the fanciest place, it is an excellent arcade for kids and parents to spend a day together. So far there isn’t much to entice adults, though; with only a handful of non-ticket games and no restaurant or bar ready yet, this really is a space for kids to enjoy right now. And with so little of that in the area, it’s an excellent place for Chicago to have. It’s not necessarily the flashiest or snazziest arcade in the city, but if you are on the south side, or if you’re headed to Chicago Indoor Sports anyway, I highly recommend checking out Razzmatazz.